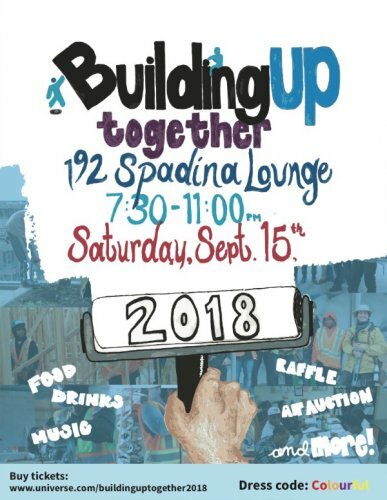 Building Up is thrilled to announce their Second Annual Fundraiser! Last year's event was a huge success, so let's get together and do it all over again! Since last year, the Building Up Family has grown. We've added two new business divisions, expanded our program offerings and more than doubled the size of our management team. As a result we have now trained over 100 pre-apprentices as they transition from trainees to tradespeople. With your support, we will be able to take that number to 200 over the next year. A silent art auction featuring original artwork by local Toronto artists. Last year, these artists transformed toilet seats, lids and toilets into unique masterpieces. This year, they're taking it to the next level with our signature toilet seats, as well as creative pieces made from recycled and repurposed materials from Building Up job sites, as well as art on canvases made by our trainees. Delicious snacks made from local and sustainable ingredients, supplied by Hawthorne Food and Drink, a social enterprise providing training and career development in the hospitality sector. Plenty of drink options - Each ticket purchased comes with one free drink of your choice! Incredible raffle prizes, including dinner at some of Toronto's top restaurants, tickets to sports events, and MORE! A photo exhibit featuring photos of Building Up's trainees and alumni, as well as some of our current projects. Award Ceremony, fantastic music, and entertainment throughout the evening! We'll have our DJ spinning all night, as well as a special performance from a Building Up alumnus. A magician will be working the room too! Funds raised from Building Up Together 2018 will go towards creating opportunities for sustainable careers. We're very excited to celebrate how far Building Up has come with our team, trainees, partners, supporters, and friends. None of this would be possible without all of YOU!